Sunk by aircraft, 7 December 1941. 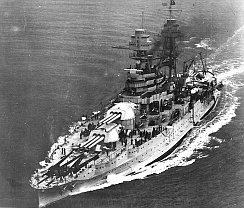 USS Arizona was the second ship of the Pennsylvania class. For the duration of America's participation in the First World War USS Arizona was based in Norfolk, Virginia. She patrolled the Eastern seaboard of the United States from the Virginia Capes to New York and also served as a gunnery training ship. Modernised between the wars; improvements included new machinery, increased protection and replacing the cage-masts with tripods. During the Japanese attack on Pearl Harbour on 7 December 1941, USS Arizona was struck by two bombs, the second of which started a fire that ignited the forward magazine for the main armament. The resulting explosion devastated the front half of the ship and sank her. In all 1,177 of the 1,400 crew were killed. USS Arizona was struck from the Naval Vessel Register on 1 December 1942, being deemed to badly damaged to repair. Subsequently a memorial was constructed on the site of the wreck, which was never raised. If you have spotted any errors on this page (Battleship USS Arizona) or have anything to contribute please post it on the battleship forum.